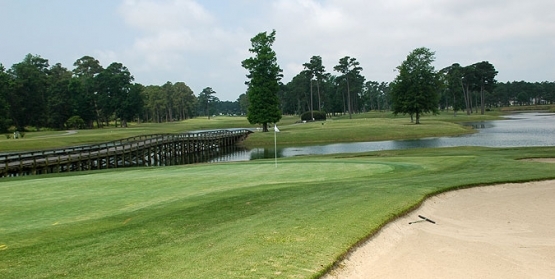 The Willard Byrd Course at Sea Trail Plantation is a challenging yet fun course in Sunset Beach, North Carolina. It is one of the three courses that make up Sea Trail Plantation. The Byrd Course is a fairly wide open layout that features tree-lined fairways and abundant bunkering and water hazards. The Byrd Course offers something for everyone with its yardages measuring 6,740 yards from the blue tees, 6,251 yards from the white tees, 5,561 yards from the gold tees and 4,621 from the red tees. While navigating your way through the vast waste bunkers and man-made water hazards it is necessary to play strategically. The large, undulating greens are well protected with bunkers. The Byrd Course can be included with any Myrtle Beach Golf Authority golf package, allowing you to take advantage of the outstanding North Myrtle Beach accommodations that include hotels, condos and ocean front beach houses. When looking for the best in Myrtle Beach golf deals, Myrtle Beach Golf Authority is unsurpassed. Book your Myrtle Beach, South Carolina vacation today!